Apps are essential. When we buy a tablet or a smartphone, it is a world of apps we are acquiring; by that token, the app store’s efficiency in pinpointing exactly the right apps for our needs is paramount to the overall value of a device. But how good are they? This report answers two simple questions: first, how mature are the three major app stores, and, more importantly, how good could they be? This report analyzes the three major app providers for smartphones and tablets, the iOS App Store from Apple, Google Play (Apps), and the Amazon Appstore. All app stores provide the same core functionality: they display apps listed in order of popularity, organizing them in a basic set of categories, and sorting them according to a fixed set of criteria (“most popular free”; “trending”) and add a certain number of handpicked apps to the mix. This report looks at what lies beyond this core functionality. How do app stores help you mine the amazing variety of apps that is out there? To analyze and rate the maturity and sophistication of the available app stores we used four specific research angles: search, discovery assistance and content curation, the App Store Maturity Evaluation Grid, and App Store User Experience Friction, or App Store UXF. 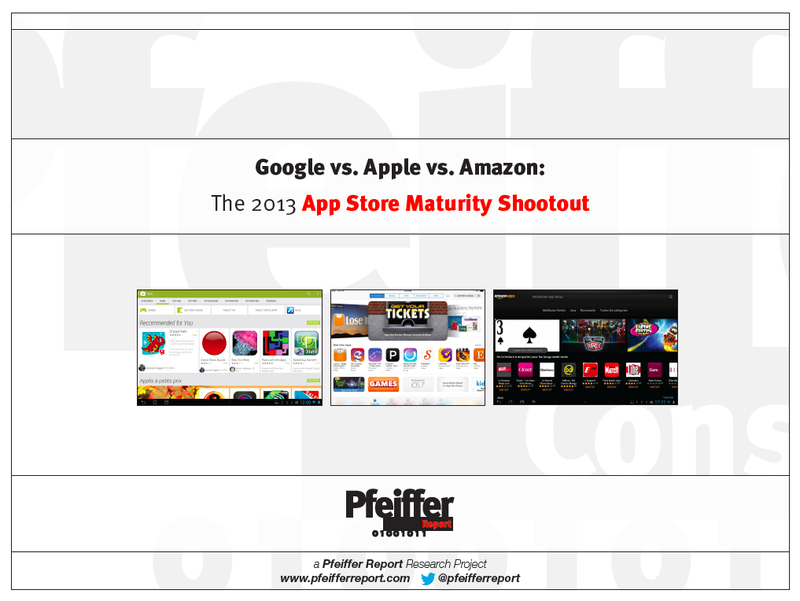 All of these aspects were rated based on the 2013 App Store Reference Definition, an idealized set of features for a mature, sophisticated app store developed by Pfeiffer Consulting, making it possible to quantify the maturity of currently available app stores in a more objective way, by comparing them not only to their direct competition, but to an independent reference. None of the app stores come even close to the ideal score at this time. Beyond popularity ratings, what do the app stores offer to enhance serendipitous discovery of apps for a great variety of users and interests? This benchmark empirically surveyed the number of specially featured apps, number of groups of apps for specific needs and activities, as well as number of subcategories. The App Store Evaluation grid provides a unified score based on eight key characteristics that are individually rated on a scale of 1 to 5. The eight characteristics analyzed here are the key aspects that differentiate a mature app store from the baseline functionality prevalent today. Areas analyzed include content curation and presentation of individual apps, among others. User Experience Friction also exists in app stores, as this survey documents. Looking at the UXF findings in detail allows us to underline some of the issues in app stores that we have long overcome in stores for physical goods, such as regional lock-in, i.e. the fact of forcing a user to shop at a specific local store, rather than letting him decide on his own where he wants to shop.